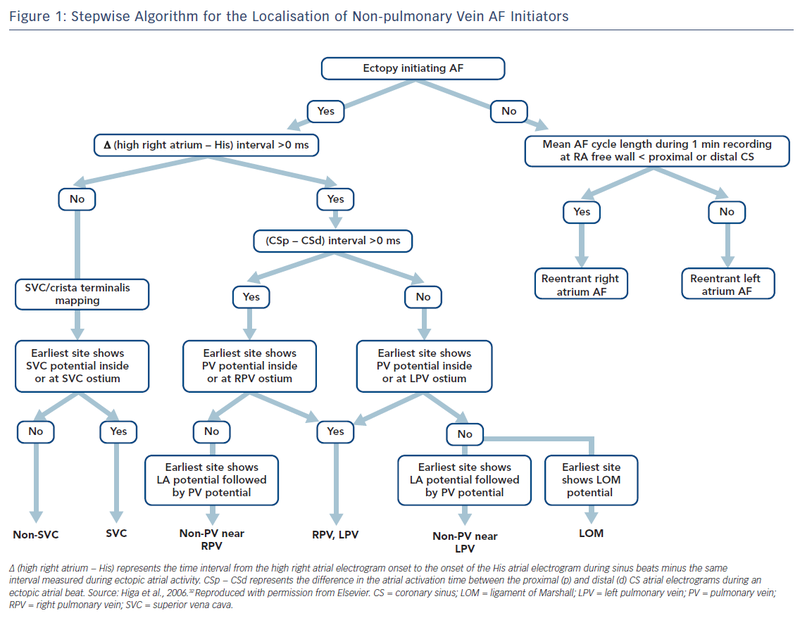 Pulmonary veins (PVs) are a major source of ectopic beats that initiate AF. PV isolation from the left atrium is an effective therapy for the majority of paroxysmal AF. 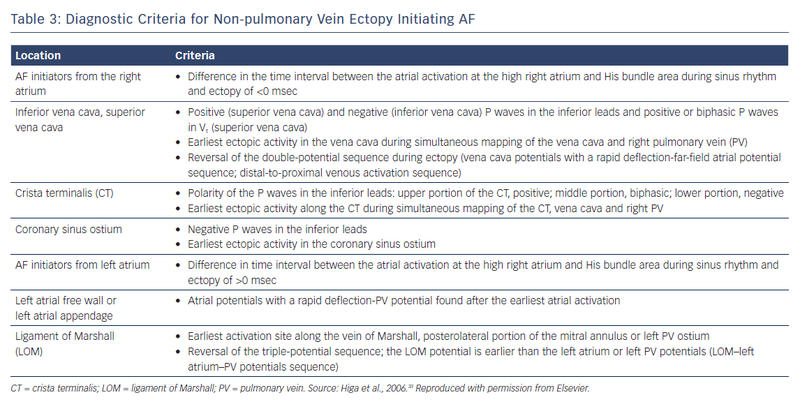 However, investigators have reported that ectopy originating from non-PV areas can also initiate AF. Patients with recurrent AF after persistent PV isolation highlight the need to identify non-PV ectopy. Furthermore, adding non-PV ablation after multiple AF ablation procedures leads to lower AF recurrence and a higher AF cure rate. These findings suggest that non-PV ectopy is important in both the initiation and recurrence of AF. This article summarises current knowledge about the electrophysiological characteristics of non- PV AF, suitable mapping and ablation strategies, and the safety and efficacy of catheter ablation of AF initiated by ectopic foci originating from non-PV areas. 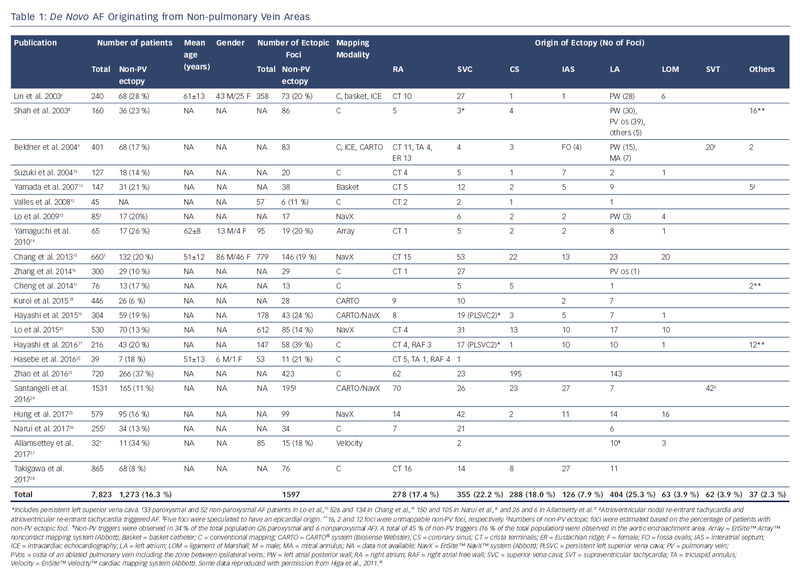 Arrhythmia & Electrophysiology Review 2018;7(4):273–81. Mapping studies of non-PV foci have revealed that triggers are often found in anatomically predictable regions, such as the left atrial wall, thoracic veins and crista terminalis, and can be sustained or non-sustained triggers of AF. These areas can be mapped by specific multielectrode catheters positioned in key regions and ablated after the AF is induced and localised, or they can be ablated empirically without the induction of ectopy.1–34 This review focuses on catheter ablation of AF initiated by non-PV triggers, summarising the electrophysiological characteristics, mapping and ablation strategies, their safety and efficacy. Careful observation of P wave morphology is useful for predicting the approximate location of AF ectopy.32–34,65 A negative P wave or the presence of a negative component in V1 is predictive of an RA origin of AF initiation. Ectopy originating from the SVC or upper portion of the crista terminalis exhibits upright P waves in the inferior leads; ectopy from the CS ostium produces negative P wave polarity in the inferior leads; and ectopy from the middle portion of the crista terminalis results in biphasic P waves. Negative P waves with a long duration in V1 may be associated with RA free-wall ectopy, including the tricuspid annulus. If RA AF ectopy is suspected, the use of a duo-decapolar catheter is useful for mapping along the crista terminalis to the SVC.2,4–7,32–34 Bipolar signals from the proximal portion of the SVC usually exhibit a blunted atrial signal followed by a discrete sharp SVC signal during sinus rhythm.32–34 The activation sequence of these double potentials is reversed during SVC ectopy. Bipolar signals from the distal part of the SVC usually exhibit double potentials: the first component represents a SVC near-field sharp potential; and the second component, a right superior PV far-field blunted signal. During SVC ectopy, the activation sequence of these double potentials remains unchanged. The activation sequence is reversed during right PV ectopy. The earliest bipolar electrogram site with unipolar QS pattern recorded from the origin is the ablation target for non-PV ectopy.2,4–7,32–34 Ablation of an ectopic focus and/or electrical isolation of an arrhythmogenic thoracic vein can be achieved with the application radiofrequency energy for around 30 seconds with a non-irrigated tip at 50–55 °C or with an irrigated tip at <25–30 W.2,4–6,32–34 A contact force catheter can be used to create durable transmural lesions. This method has a lower arrhythmia recurrence and a lower incidence of atrial tachyarrhythmias resulting from incomplete ablation due to proarrhythmic lesion gaps. However, caution should be taken to avoid the application of excessive energy and/or contact pressure at the posterior LA wall close to the oesophagus. Persistent left SVC is also a well-recognised trigger site for AF.19,21,78–85 The connecting musculature means that multiple electrical signals are conducted to the posterolateral LA and middle portion of the CS from the left SVC trigger site. Complete left SVC isolation may be challenging, as it is close to the oesophagus and left phrenic nerve. There have been rare reports of inferior vena cava triggers.86,87 In these cases, the IVC triggers were successfully eliminated with a focal/isolation strategy. Focal ablation of the earliest activation site preceding the onset of AF should be performed until a complete elimination of the ectopy is achieved in patients with interatrial septal triggers. Near-simultaneous atrial activation of the multielectrode catheters located in the high RA, His bundle region and CS ostium can be observed in such cases. Simultaneous mapping of the right and left atrial septum is crucial to successfully locate and ablate this trigger. Focal ablation of the earliest activation site in the crista terminalis during ectopy preceding AF onset should be performed until complete elimination of the ectopy initiating AF or >50 % reduction in the amplitude of the initial local electrogram at the ablation site.6,32–34 A region with transverse gap conduction in the crista terminalis can be an arrhythmogenic source of re-entry and also ectopy initiating AF. Linear ablation of the transverse gap should address both of these problems.32–34,66 Intracardiac echocardiography can provide real-time monitoring of the anatomical relationship between the crista terminalis and the catheter position during the procedure. For patients with a CS trigger, electrical isolation of the arrhythmogenic CS musculature from the atrium by endocardial and/or epicardial ablation under the guidance of a 3D mapping system is preferable.32–34,71 The aim is to eliminate (entrance block) and/or dissociate (exit block) the CS potential.88–91 Care must be taken if an inappropriate impedance rise occurs during CS ablation, and the application of radiofrequency energy should be stopped immediately to prevent any steam pops. The left atrial appendage (LAA) has been reported to be a trigger of AF.96 Due to its large structure, triggers may arise from the LAA ostium, body or tip. Simultaneous mapping of the left superior PV and LAA can differentiate between a near-field sharp and a far-field blunt signals and identify true LAA triggers. Focal ablation can be applied to avoid LAA isolation. LAA isolation is only indicated when the patient can tolerate long-standing anticoagulation or a LAA occlusion device is indicated. Evidence suggests that inducing the non-PV ectopic trigger responsible for initiating AF both before and after PV isolation is an indispensable step in both initial and repeat ablation/isolation procedures. Advances in mapping and alternative energy modalities with 3D navigation are likely to play an important role in the ablation of non-PV ectopy. Together, these advances and the systematic identification of the trigger foci and their successful elimination will improve overall AF ablation outcomes. The mechanisms of paroxysmal AF originating from non-pulmonary vein areas are automaticity, triggered activity, and microreentry. The diagnosis is made on the basis of a spontaneous onset of the ectopic beats initiating AF during baseline or after provocative manoeuvres. The earliest activation sites are the targets for focal ablation. The myocardial sleeve surrounding the ostium of the vena cava is the target for isolation. Success rates are >99 % for the vena cava and 78 % for the ligament of Marshall. Chen SA, Hsieh MH, Tai CT, et al. Initiation of atrial fibrillation by ectopic beats originating from the pulmonary veins: Electrophysiological characteristics, pharmacological responses, and effects of radiofrequency ablation. Circulation 1999;100:1879–86. Oral H, Knight BP, Tada H, et al. Pulmonary vein isolation for paroxysmal and persistent atrial fibrillation. Circulation 2002;105:1077–81. Chen SA, Tai CT, Yu WC, et al. Right atrial focal atrial fibrillation: Electrophysiologic characteristics and radiofrequency catheter ablation. J Cardiovasc Electrophysiol 1999;10:328–35. Tsai CF, Tai CT, Hsieh MH, et al. Initiation of atrial fibrillation by ectopic beats originating from the superior vena cava: Electrophysiological characteristics and results of radiofrequency ablation. Circulation 2000;102:67–74. Lin WS, Tai CT, Hsieh MH, et al. Catheter ablation of paroxysmal atrial fibrillation initiated by non-pulmonary vein ectopy. Circulation 2003;107:3176–83. Tai CT, Hsieh MH, Tsai CF, et al. Differentiating the ligament of Marshall from the pulmonary vein musculature potentials in patients with paroxysmal atrial fibrillation: Electrophysiological characteristics and results of radiofrequency ablation. Pacing Clin Electrophysiol 2000;23:1493–501. Shah DC, Haissaguerre M, Jais P, et al. Nonpulmonary vein foci: Do they exist? Pacing Clin Electrophysiol 2003;26:1631–5. Beldner SJ, Zado ES, Lin D, et al. Anatomic targets for nonpulmonary triggers: Identification with intracardiac echo and magnetic mapping. Heart Rhythm 2004;1(suppl):S237. Suzuki K, Nagata Y, Goya M, et al. Impact of non-pulmonary vein focus on early recurrence of atrial fibrillation after pulmonary vein isolation. Heart Rhythm 2004;1(Suppl):S203–4. Yamada T, Murakami Y, Okada T, et al. Non-pulmonary vein epicardial foci of atrial fibrillation identified in the left atrium after pulmonary vein isolation. Pacing Clin Electrophysiol 2007;30:1323–30. Valles E, Fan R, Roux JF, et al. Localization of atrial fibrillation triggers in patients undergoing pulmonary vein isolation: importance of the carina region. J Am Coll Cardiol 2008;52:1413–20. Lo LW, Tai CT, Lin YJ, et al. Predicting factors for atrial fibrillation acute termination during catheter ablation procedures: implications for catheter ablation strategy and long-term outcome. Heart Rhythm 2009;6:311–8. Yamaguchi T, Tsuchiya T, Miyamoto K, et al. Characterization of non-pulmonary vein foci with an EnSite array in patients with paroxysmal atrial fibrillation. Europace 2010;12:1698–706. Chang HY, Lo LW, Lin YJ, et al. Long-term outcome of catheter ablation in patients with atrial fibrillation originating from nonpulmonary vein ectopy. J Cardiovasc Electrophysiol 2013;24:250–8. Zhang J, Tang C, Zhang Y, et al. Origin and ablation of the adenosine triphosphate induced atrial fibrillation after circumferential pulmonary vein isolation: effects on procedural success rate. J Cardiovasc Electrophysiol 2014;25:364–70. Cheng H, Dai YY, Jiang RH, et al. Non-pulmonary vein foci induced before and after pulmonary vein isolation in patients undergoing ablation therapy for paroxysmal atrial fibrillation: incidence and clinical outcome. J Zhejiang Univ Sci B 2014;15:915–22. Kuroi A, Miyazaki S, Usui E, et al. Adenosine-provoked atrial fibrillation originating from non-pulmonary vein foci: the clinical significance and outcome after catheter ablation. JACC Clin Electrophysiol 2015;1:127–35. Hayashi K, An Y, Nagashima M, et al. Importance of nonpulmonary vein foci in catheter ablation for paroxysmal atrial fibrillation. Heart Rhythm 2015;12:1918–24. Lo LW, Lin YJ, Chang SL, et al. Predictors and characteristics of multiple (more than 2) catheter ablation procedures for atrial fibrillation. J Cardiovasc Electrophysiol 2015;26:1048–56. Hayashi K, Fukunaga M, Yamaji K, et al. Impact of catheter ablation for paroxysmal atrial fibrillation in patients with sick sinus syndrome – important role of non-pulmonary vein foci. Circ J 2016;80:887–94. Hasebe H, Yoshida K, Iida M, et al. Right-to-left frequency gradient during atrial fibrillation initiated by right atrial ectopies and its augmentation by adenosine triphosphate: Implications of right atrial fibrillation. Heart Rhythm 2016;13:354–63. Zhao Y, Di Biase L, Trivedi C, et al. Importance of non-pulmonary vein triggers ablation to achieve long-term freedom from paroxysmal atrial fibrillation in patients with low ejection fraction. Heart Rhythm 2016;13:141–9. Hung Y, Lo LW, Lin YJ, et al. Characteristics and long-term catheter ablation outcome in long-standing persistent atrial fibrillation patients with non-pulmonary vein triggers. Int J Cardiol 2017;241:205–11. Narui R, Matsuo S, Isogai R, et al. Impact of deep sedation on the electrophysiological behavior of pulmonary vein and non-PV firing during catheter ablation for atrial fibrillation. J Interv Card Electrophysiol 2017;49:51–7. Allamsetty S, Lo LW, Lin YJ, et al. Impact of aortic encroachment to left atrium on non-pulmonary vein triggers of atrial fibrillation. Int J Cardiol 2017;227:650–5. Takigawa M, Takahashi A, Kuwahara T, et al. Long-term outcome after catheter ablation of paroxysmal atrial fibrillation: Impact of different atrial fibrillation foci. Int J Cardiol 2017;227:407–12. Takigawa M, Takahashi A, Kuwahara T, et al. Impact of non-pulmonary vein foci on the outcome of the second session of catheter ablation for paroxysmal atrial fibrillation. J Cardiovasc Electrophysiol 2015 ;26:739–46. Mohanty S, Mohanty P, Di Biase L, et al. Long-term follow-up of patients with paroxysmal atrial fibrillation and severe left atrial scarring: comparison between pulmonary vein antrum isolation only or pulmonary vein isolation combined with either scar homogenization or trigger ablation. Europace 2017;19:1790–7. Cappato R, Negroni S, Pecora D, et al. Prospective assessment of late conduction recurrence across radiofrequency lesions producing electrical disconnection at the pulmonary vein ostium in patients with atrial fibrillation. Circulation 2003;108:1599–604. Higa S, Tai CT, Chen SA. Catheter ablation of atrial fibrillation originating from extrapulmonary vein areas: Taipei approach. Heart Rhythm. 2006;3:1386–90. Higa S, Tai CT, Chen SA. Catheter ablation of paroxysmal atrial fibrillation originating from the non-pulmonary vein areas. In: Huang S, Wood M (eds). Catheter Ablation of Cardiac Arrhythmias. Philadelphia: Elsevier, 2006; 289–304. Higa S, Lin YJ, Lo LW, et al. Catheter ablation of paroxysmal atrial fibrillation originating from the non-pulmonary vein areas. In: Huang S, Wood M (eds). Catheter Ablation of Cardiac Arrhythmias. 2nd edn. Philadelphia: Elsevier, 2011; 265–79. Mangrum JM, Mounsey JP, Kok LC, et al. Intracardiac echocardiography-guided, anatomically based radiofrequency ablation of focal atrial fibrillation originating from pulmonary veins. J Am Coll Cardiol 2002;39:1964–72. Natale A, Pisano E, Beheiry S, et al. Ablation of right and left atrial premature beats following cardioversion in patients with chronic atrial fibrillation refractory to antiarrhythmic drugs. Am J Cardiol 2000;85:1372–5. Jais P, Weerasooriya R, Shah DC, et al. Ablation therapy for atrial fibrillation (AF): Past, present and future. Cardiovasc Res 2002;54:337–46. Schmitt C, Ndrepepa G, Weber S, et al. Biatrial multisite mapping of atrial premature complexes triggering onset of atrial fibrillation. Am J Cardiol 2002;89:1381–7. Lee SH, Tai CT, Hsieh MH, et al. Predictors of non-pulmonary vein ectopic beats initiating paroxysmal atrial fibrillation: implication for catheter ablation. J Am Coll Cardiol 2005;46:1054–9. Keith A, Flack M. The form and nature of the primary divisions of the vertebrate heart. J Anat 1907;41:189. Chen YJ, Chen YC, Yeh HI, et al. Electrophysiology and arrhythmogenic activity of single cardiomyocytes from canine superior vena cava. Circulation 2002;105:2679–85. Yeh HI, Lai YJ, Lee SH, et al. Heterogeneity of myocardial sleeve morphology and gap junctions in canine superior vena cava. Circulation 2001;104:3152–7. Chang KC, Lin YC, Chen JY, et al. Electrophysiological characteristics and radiofrequency ablation of focal atrial tachycardia originating from the superior vena cava. Jpn Circ J 2001;65:1034–40. Ooie T, Tsuchiya T, Ashikaga K, et al. Electrical connection between the right atrium and the superior vena cava, and the extent of myocardial sleeve in a patient with atrial fibrillation originating from the superior vena cava. J Cardiovasc Electrophysiol 2002;13:482–5. Goya M, Ouyang F, Ernst S, et al. Electroanatomic mapping and catheter ablation of breakthroughs from the right atrium to the superior vena cava in patients with atrial fibrillation. Circulation 2002;106:1317–20. Jayam VK, Vasamreddy C, Berger R, et al. Electrical disconnection of the superior vena cava from the right atrium. J Cardiovasc Electrophysiol 2004;15:614. Ino T, Miyamoto S, Ohno T, et al. Exit block of focal repetitive activity in the superior vena cava masquerading as a high right atrial tachycardia. J Cardiovasc Electrophysiol 2000;11:480–3. Spach MS, Barr RC, Jewett PH. Spread of excitation from the atrium into thoracic veins in human beings and dogs. Am J Cardiol 1972;30:844–54. Zipes DP, Knope RF. Electrical properties of the thoracic veins. Am J Cardiol 1972;29:372–6. Hashizume H, Ushiki T, Abe K. A histological study of the cardiac muscle of the human superior and inferior venae cavae. Arch Histol Cytol 1995;58:457–64. Mary-Rabine L, Hordof AJ, Danilo P Jr, et al. Mechanisms for impulse initiation in isolated human atrial fibers. Circ Res 1980;47:267–77. Gelband H, Bush HL, Rosen MR, et al. Electrophysiologic properties of isolated preparations of human atrial myocardium. Circ Res 1972;30:293–300. Ten Eick RE, Singer DH. Electrophysiological properties of diseased human atrium. Circ Res 1979;44:545–57. Kalman JM, Olgin JE, Karch MR, et al. “Cristal tachycardias”: Origin of right atrial tachycardias from the crista terminalis identified by intracardiac echocardiography. J Am Coll Cardiol 1998;31:451–9. Boineau JP, Canavan TE, Schuessler RB, et al. Demonstration of a widely distributed atrial pacemaker complex in the human heart. Circulation 1988;77:1221–37. Hwang C, Chen PS: Clinical electrophysiology and catheter ablation of atrial fibrillation from the ligament of Marshall. In: Chen SA, Haissaguerre M, Zipes DP, (eds). Thoracic Vein Arrhythmias: Mechanisms and Treatment. Malden: Blackwell Futura, 2004;226–84. Scherlag BJ, Yeh BK, Robinson MJ. Inferior interatrial pathway in the dog. Circ Res 1972;31:18–35. Doshi RN, Wu TJ, Yashima M, et al. Relation between ligament of Marshall and adrenergic atrial tachyarrhythmia. Circulation 1999;100:876–83. Erlanger J, Blackman JR. A study of relative rhythmicity and conductivity in various regions of the auricles of the mammalian heart. Am J Physiol 1907;19:125–74. Andrew LW, Paul FC. Triggered and automatic activity in the canine coronary sinus. Circ Res. 1977;41:435–45. Tsuji M, Kato K, Tanaka H, et al. Pulmonary vein isolation for paroxysmal atrial fibrillation in a patient with stand-alone unroofed coronary sinus. HeartRhythm Case Rep 2017;3:248–50. Lee SH, Tai CT, Lin WS, et al. Predicting the arrhythmogenic foci of atrial fibrillation before atrial transseptal procedure: Implication for catheter ablation. J Cardiovasc Electrophysiol 2000;11:750–7. Frey B, Kreiner G, Gwechenberger M, et al. 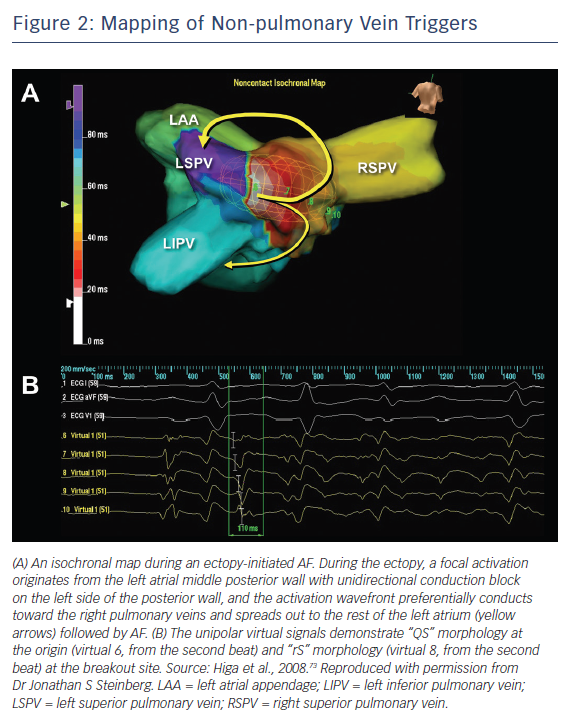 Ablation of atrial tachycardia originating from the vicinity of the atrioventricular node: Significance of mapping both sides of the interatrial septum. J Am Coll Cardiol 2001;38:394–400. Marrouche NF, Sippens-Groenewegen A, Yang Y, et al. Clinical and electrophysiologic characteristics of left septal atrial tachycardia. J Am Coll Cardiol 2002;40:1133–9. Kuo JY, Tai CT, Tsao HM, et al. P wave polarities of an arrhythmogenic focus in patients with paroxysmal atrial fibrillation originating from superior vena cava or right superior pulmonary vein. J Cardiovasc Electrophysiol 2003;14:350–7. Lin YJ, Tai CT, Liu TY, et al. Electrophysiological mechanisms and catheter ablation of complex atrial arrhythmias from crista terminalis: Insight from three-dimensional noncontact mapping. Pacing Clin Electrophysiol 2004;27:1232–9. Katritsis D, Ioannidis JP, Anagnostopoulos CE, et al. Identification and catheter ablation of extracardiac and intracardiac components of ligament of Marshall tissue for treatment ofparoxysmal atrial fibrillation. J Cardiovasc Electrophysiol 2001;12:750–8. Polymeropoulos KP, Rodriguez LM, Timmermans C, et al. Images in cardiovascular medicine: Radiofrequency ablation of a focal atrial tachycardia originating from the Marshall ligament as a trigger for atrial fibrillation. Circulation 2002;105:2112–3. Calkins H, Brugada J, Packer DL, et al. HRS/EHRA/ECAS expert consensus statement on catheter and surgical ablation of atrial fibrillation: recommendations for personnel, policy, procedures and follow-up. Heart Rhythm 2007;4:816–61. Lin YJ, Tai CT, Chang SL, et al. Efficacy of additional ablation of complex fractionated atrial electrograms for catheter ablation of nonparoxysmal atrial fibrillation. J Cardiovascular Electrophysiol 2009;20:607–15. Lo LW, Lin YJ, Tsao HM, et al. Characteristics of complex fractionated electrograms in non-pulmonary vein ectopy initiating atrial fibrillation / atrial tachycardia. J Cardiovascular Electrophysiol 2009;20:1305–12. Matsunaga-Lee Y, Takano Y. A novel mapping technique to detect non-pulmonary vein triggers: a case report of self-reference mapping technique. HeartRhythm Case Rep 2017;4:26–8. Higa S, Lin YJ, Tai CT, et al. Noncontact mapping. In: Calkin H, Jais P, Steinberg J (eds). A Practical Approach to Catheter Ablation of Atrial Fibrillation. Philadelphia: Lippincott Williams & Wilkins, 2008;118–33. Weiss C, Willems S, Rostock T, et al. Electrical disconnection of an arrhythmogenic superior vena cava with discrete radiofrequency current lesions guided by noncontact mapping. Pacing Clin Electrophysiol 2003;26:1758–61. Liu TY, Tai CT, Lee PC, et al. Novel concept of atrial tachyarrhythmias originating from the superior vena cava: Insight from noncontact mapping. J Cardiovasc Electrophysiol. 2003;14:533–9. Huang BH, Wu MH, Tsao HM, et al. Morphology of the thoracic veins and left atrium in paroxysmal atrial fibrillation initiated by superior caval vein ectopy. J Cardiovasc Electrophysiol. 2005;16:411–7. Chen SA, Tai CT. Catheter ablation of atrial fibrillation originating from the non-pulmonary vein foci. J Cardiovasc Electrophysiol 2005;16:229–32. Hsu LF, Jais P, Keane D, et al. Atrial fibrillation originating from persistent left superior vena cava. Circulation 2004;24;109:828–32. Elayi CS, Fahmy TS, Wazni OM, et al. Left superior vena cava isolation in patients undergoing pulmonary vein antrum isolation: impact on atrial fibrillation recurrence. Heart Rhythm 2006;3:1019–23. Liu H, Lim KT, Murray C, et al. Electrogram-guided isolation of the left superior vena cava for treatment of atrial fibrillation. Europace 2007;9:775–80. Tsutsui K, Ajiki K, Fujiu K, et al. Successful catheter ablation of atrial tachycardia and atrial fibrillation in persistent left superior vena cava. Int Heart J 2010;51:72–4. Aras D, Cay S, Topaloglu S, et al. A rare localization for non-pulmonary vein trigger of atrial fibrillation: persistent left superior vena cava. Int J Cardiol 2015;187:235–6. Abrich VA, Munro J, Srivathsan K. Atrial fibrillation ablation with persistent left superior vena cava detected during intracardiac echocardiography. HeartRhythm Case Rep 2017; 3:455–8. Huang S, Pan B, Zou H, et al. Cryoballoon ablation for paroxysmal atrial fibrillation in a case of persistent left superior vena cava. BMC Cardiovasc Disord 2018;18:51. Matsumoto S, Matsunaga-Lee Y, Masunaga N, et al. The usefulness of ventricular pacing during atrial fibrillation ablation in a persistent left superior vena cava: A case report. Indian Pacing Electrophysiol J 2018;18:155–8. Mansour M, Ruskin J, Keane D. Initiation of atrial fibrillation by ectopic beats originating from the ostium of the inferior vena cava. J Cardiovasc Electrophysiol 2002;13:1292–5. Scavee C, Jais P, Weerasooriya R, et al. The inferior vena cava: An exceptional source of atrial fibrillation. J Cardiovasc Electrophysiol 2003;14:659–62. Rotter M, Sanders P, Takahashi Y, et al. Images in cardiovascular medicine: Coronary sinus tachycardia driving atrial fibrillation. Circulation 2004;110:e59–60. Sanders P, Jais P, Hocini M, et al. Electrical disconnection of the coronary sinus by radiofrequency catheter ablation to isolate a trigger of atrial fibrillation. J Cardiovasc Electrophysiol 2004;15:364–8. Yamada T, Murakami Y, Plumb VJ, et al. Focal atrial fibrillation originating from the coronary sinus musculature. Heart Rhythm 2006;3:1088–91. Rostock T, Lutomsky B, Steven D, et al. The coronary sinus as a focal source of paroxysmal atrial fibrillation: more evidence for the ‘fifth pulmonary vein’? Pacing Clin Electrophysiol 2007;30:1027–31. Tuan TC, Tai CT, Lin YK, et al. Use of fluoroscopic views for detecting Marshall’s vein in patients with cardiac arrhythmias. J Interv Card Electrophysiol 2003;9:327–31. Katritsis D, Giazitzoglou E, Korovesis S, et al. Epicardial foci of atrial arrhythmias apparently originating in the left pulmonary veins. J Cardiovasc Electrophysiol 2002;13:319–23. Keida T, Fujita M, Okishige K, et al. Elimination of non-pulmonary vein ectopy by ethanol infusion in the vein of Marshall. Heart Rhythm 2013;10:1354–6. Dave AS, Báez-Escudero JL, Sasaridis C, et al. Role of the vein of Marshall in atrial fibrillation recurrences after catheter ablation: therapeutic effect of ethanol infusion. J Cardiovasc Electrophysiol 2012;23:583-91. Di Biase L, Schweikert RA, Saliba WI, et al. Left atrial appendage tip: an unusual site of successful ablation after endocardial and epicardial mapping and ablation. J Cardiovasc Electrophysiol 2010;21:203–6. Pastor A, Núñez A, Magalhaes A, et al. The superior vena cava as a site of ectopic foci in atrial fibrillation. Rev Esp Cardiol 2007;60:68–71. Higuchi K, Yamauchi Y, Hirao K, et al. Superior vena cava as initiator of atrial fibrillation: factors related to its arrhythmogenicity. Heart Rhythm 2010;7:1186–91. Chang HY, Lo LW, Lin YJ, et al. Long-term outcome of catheter ablation in patients with atrial fibrillation originating from the superior vena cava. J Cardiovasc Electrophysiol 2012;23:955–61. Yang PS, Park JG, Pak HN. Catheter ablation for cold water swallowing-induced paroxysmal atrial fibrillation: a case report. Heart Rhythm 2014;11:2300–2. Miyazaki S, Taniguchi H, Kusa S, et al. Factors predicting an arrhythmogenic superior vena cava in atrial fibrillation ablation: insight into the mechanism. Heart Rhythm 2014;11:1560–6. Inada K, Matsuo S, Tokutake K, et al. Predictors of ectopic firing from the superior vena cava in patients with paroxysmal atrial fibrillation. J Interv Card Electrophysiol 2015;42:27–32. Esato M, Nishina N, Kida Y, et al. A case of paroxysmal atrial fibrillation with a non-pulmonary vein trigger identified by intravenous adenosine triphosphate infusion. J Arrhythm 2015;31:318–22. Sugimura S, Kurita T, Kaitani K, et al. Ectopies from the superior vena cava after pulmonary vein isolation in patients with atrial fibrillation. Heart Vessels 2016;31:1562–9. Miranda-Arboleda AF, Munro J, Srivathsan K. Sinus node injury during adjunctive superior vena cava isolation in a patient with triggered atrial fibrillation. Indian Pacing Electrophysiol J 2016;16:96–8. Nagase T, Kato R, Asano S, et al. AF sustained in only a small area of SVC. Intern Med 2017;56:2239–40. Trindade MLZHD, Rodrigues ACT, Pisani CF, et al. Superior vena cava syndrome after radiofrequency catheter ablation for atrial fibrillation. Arq Bras Cardiol 2017;109:615-7. Enriquez A, Liang JJ, Santangeli P, et al. Focal atrial fibrillation from the superior vena cava. J Atr Fibrillation 2017;9:1593. Yagishita A, Yamauchi Y, Miyamoto T, et al. Electrophysiological evidence of localized reentry as a trigger and driver of atrial fibrillation at the junction of the superior vena cava and right atrium. HeartRhythm Case Rep 2017;3:164–6. Ebana Y, Nitta J, Takahashi Y, et al. Association of the clinical and genetic factors with superior vena cava arrhythmogenicity in atrial fibrillation. Circ J 2017;82:71–7. Tanaka Y, Takahashi A, Takagi T, et al. Novel ablation strategy for isolating the superior vena cava using ultra high-resolution mapping. Circ J 2018;82:2007–15. Kashimura S, Nishiyama T, Kimura T, et al. Vein of Marshall partially isolated with radiofrequency ablation from the endocardium. HeartRhythm Case Rep 2016;3:120–3. Inamura Y, Nitta J, Sato A, et al. Successful ablation for non-pulmonary multi-foci atrial fibrillation/tachycardia in a patient with coronary sinus ostial atresia by transseptal puncture and epicardial approach. HeartRhythm Case Rep 2017;3:272–6. Chang SL, Tuan TC, Tai CT, et al. Comparison of outcome in catheter ablation of atrial fibrillation in patients with versus without the metabolic syndrome. Am J Cardiol 2009;103:67–72. Lee RJ, Kalman JM, Fitzpatrick AP, et al. Radiofrequency catheter modification of the sinus node for “inappropriate” sinus tachycardia. Circulation 1995;92:2919–28. Callans DJ, Ren JF, Schwartzman D, et al. Narrowing of the superior vena cava-right atrium junction during radiofrequency catheter ablation for inappropriate sinus tachycardia: Analysis with intracardiac echocardiography. J Am Coll Cardiol 1999;33:1667–70. Man KC, Knight B, Tse HF, et al. Radiofrequency catheter ablation of inappropriate sinus tachycardia guided by activation mapping. J Am Coll Cardiol 2000;35:451–7. Black-Maier E, Pokorney SD, Barnett AS, et al. Risk of atrioesophageal fistula formation with contact force-sensing catheters. Heart Rhythm 20;14:1328–33. John RM, Kapur S, Ellenbogen KA, et al. Atrioesophageal fistula formation with cryoballoon ablation is most commonly related to the left inferior pulmonary vein. Heart Rhythm 2017;14:184–9. Jhuo SJ, Lo LW, Chang SL, et al. Periesophageal vagal plexus injury is a favorable outcome predictor after catheter ablation of atrial fibrillation. Heart Rhythm 2016;13:1786–93. Saha SA, Trohman RG. Periesophageal vagal nerve injury following catheter ablation of atrial fibrillation: a case report and review of the literature. HeartRhythm Case Rep 2015;1:252–6. Tsao HM, Wu MH, Higa S, et al. Anatomic relationship of the esophagus and left atrium: implication for catheter ablation of atrial fibrillation. Chest 2005;128:2581–7. Carroll BJ, Contreras-Valdes FM, Heist EK, et al. Multi-sensor esophageal temperature probe used during radiofrequency ablation for atrial fibrillation is associated with increased intraluminal temperature detection and increased risk of esophageal injury compared to single-sensor probe. J Cardiovasc Electrophysiol 2013;24:958–64. Koranne K, Basu-Ray I, Parikh V, et al. Esophageal temperature monitoring during radiofrequency ablation of atrial fibrillation: a meta-analysis. J Atr Fibrillation 2016;9:1452. Tsuchiya T, Ashikaga K, Nakagawa S, et al. Atrial fibrillation ablation with esophageal cooling with a cooled water-irrigated intraesophageal balloon: a pilot study. J Cardiovasc Electrophysiol 2007;18:145–50. Parikh V, Swarup V, Hantla J, et al. Feasibility, safety, and efficacy of a novel preshaped nitinol esophageal deviator to successfully deflect the esophagus and ablate left atrium without esophageal temperature rise during atrial fibrillation ablation: The DEFLECT GUT study. Heart Rhythm 2018;15:1321–7. Kuwahara T, Takahashi A, Takahashi Y, et al. Clinical characteristics of massive air embolism complicating left atrial ablation of atrial fibrillation: lessons from five cases. Europace 2012;14:204–8.